A Study – based on a youtube drawing demonstration by Sergey Lebedev, a graphite drawing (8×10) on Strathmore Bristol Vellum paper. Graphite was my choice of medium for this scene. Mr. Lebedev is an accomplished artist I found on the internet; he has produced several youtube video’s demonstrating his techniques for drawing landscapes. This guy is very good – the final drawings shown in his 5 minute video’s are excellent. I learned a lot by watching the few he produced and decided to do a study based on one of his drawings. Even though I titled the piece “A Study,” as I reached the halfway point in working on this drawing my own artistic instinct for how the scene should develop took over. While the foundation of his landscape is present, my final drawing reflects more of the vision I had for this country scene. It was a great learning opportunity. 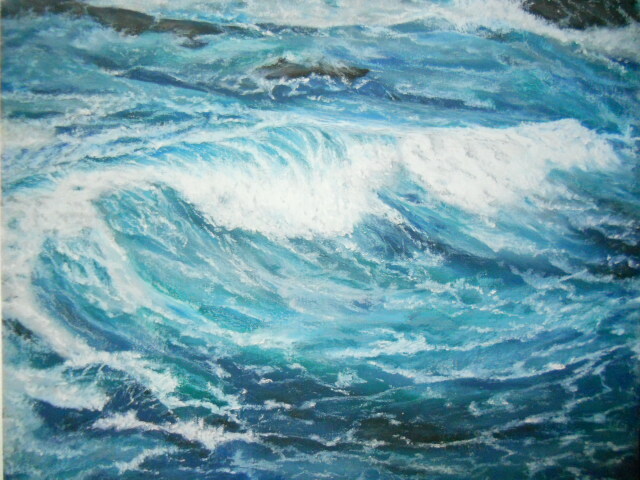 This entry was posted in Drawings and tagged art, drawing, fine art, landscape, study. Bookmark the permalink. Thank you for your lovely comment and for visiting my blog! Great to see you Ruth. Thanks very much, I’m right with you – lets get on that bike and ride the bumpy pathway to see what surprises we might find in the background! You have an unmistakable style, Mary, yet I like that you glance around to perceive what more you can realize… Have an extraordinary end of the week! Thank you for your lovely comment and compliment – means a lot to have received it. Nice to meet you, thank you for visiting. Wow – so much beauty in all the detail! Means a lot to me Fiona – thank you for your kind response!! I love this piece, Mary. Rather quiet and soft with delicate detailing in the trees. Lovely. Hi Jane, thanks so much for your read on this scene – really appreciate your response. I seem to be drawn to landscapes like this, they make for some great subjects to work out in charcoal or graphite. Beautiful! It really draws you in. Thank you so much Catherine for your response to the drawing! Mary, this is a true joy. 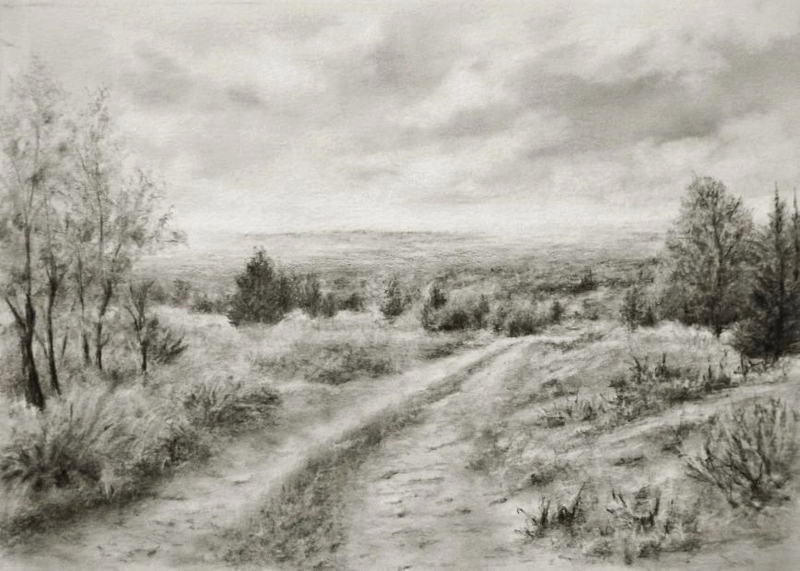 The path is so inviting, the graphite medium so intricate, and the vast wilderness is hopeful and freeing. I especially enjoyed hearing how you learned from the video, and then at what point your own artistic breath took over. I really enjoyed reading your response to this post and drawing Jet, it’s such a compliment as I saw the scene through your eyes. Thank you for always being supportive and engaging in my work. Have a wonderful Sunday! Wow Robert you know how to write a response – thank you for always being so kind and generous. My goal is to improve my drawings in graphite or charcoal so my style is still there, but more substantial scenes are developed. Glad the posts can be useful for you, I’m very happy to read that you are drawing – a process that for me is totally relaxing. You have a distinctive style, Mary, but I like that you look around to see what more you can learn. 🙂 Have a great weekend! Thank you so much Jo for being so thoughtful. I’m still at an early stage in developing art and to find information, such as what Sergey provided, well it goes a long way in helping me to improve especially in drawing. Have a wonderful weekend too! Thanks Kendall – I really do appreciate it!! Wonderful to be inspired by others. And made more special because you decided to follow your own path. Beautiful, Mary. Thanks Amy so much for your generous feedback and read of the scene – means a lot. We are lucky to live in a time when there is so much information available, the resources of the internet is beyond anyone’s imagination. There is a good side of the internet that, as I wrote earlier, is priceless. I can see how it would be a great resource to you in photography. Thanks again – have a wonderful weekend. It’s wonderful, Mary! I hope Mr. Lebedev gets to see this!!!! Thanks Resa – hope you have a great weekend! I’m loving all of your graphite work Mary. Thanks so much for visiting and leaving your generous comment – I really appreciate it! Very cool Susan, thanks so much! I was curious and looked up graphite as a medium and found that it allows greater detail, which I see in your work. Your art is as interesting as it is beautiful. Have a great weekend, Mary. Great to see you again Elisa – thank you so much for your response to graphite, it is a neat medium to draw with. Can’t tell you how much your feedback means to me, thanks again and hope you have a wonderful weekend too! Well, your studying certainly paid off Mary, this is stunning! Great job, indeed. Thanks very much Jill, you know how to make my day! Always appreciate your support and encouragement ~ have a great weekend. Beautiful drawing. Your mark-making and value work brings this composition to life! Really nice. Beautiful, so much detail and atmosphere so nicely handled. Thanks so much Anna for your nice comment – I really appreciate it. I know I’ve said it before, but it bears repeating. The sense of movement you create in these drawings is magical. Thank you Derrick for your compliment and nice thoughts. This was a great scene to work out in graphite, I really enjoyed where the process took me on this one. That’s absolutely beautiful Mary. I can imagine walking down that track and taking in the view. Hi Mike, thanks very much – a wonderful compliment when one of my drawings transports the viewer. Hopefully you can take a few photographs along the pathway!! I just found his videos on you tube, I’m inspired, I may go out with a pencils and pad today instead of paint. By the way I think your drawing is really excelent. Thanks Rose Elaine – I think you’ll enjoy!